During December annual wholesale gas and power prices were relatively stable, but shorter-dated contracts rose to 10-month highs as a result of increased demand following colder weather. Oil, coal and carbon prices all dipped in early December following fears over the economies in the EU and US. But hopes of renewed growth in China boosted prices back to November levels later in the month. 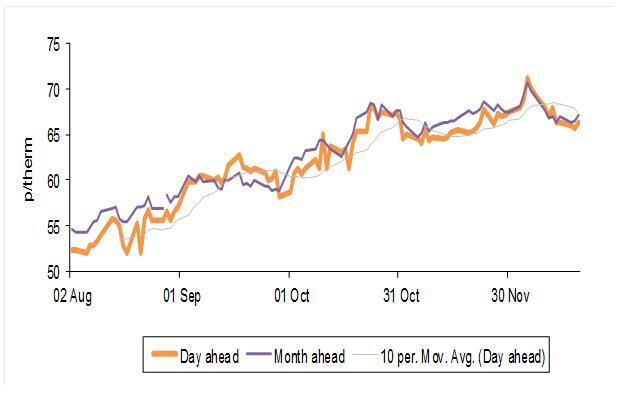 Overall month-ahead Brent crude oil dropped 0.3% to a monthly average of $108.9/bl. Coal prices also dropped slightly, by 0.2%, to average $95.9/t. Carbon prices plummeted to new lows as the EU postponed its decision on plans to bolster the market. The 2013 contract dropped as low as €5.7/t on 5 December but recovered to €7.0/t by 19 December. This stability fed through to wholesale power and gas prices. The annual power contract dropped a shade, 0.4% month-on-month to average £51.8/MWh. Yearly power prices were also near-unchanged. The annual gas contract was up 0.4% to a monthly average of 66.6p/th. 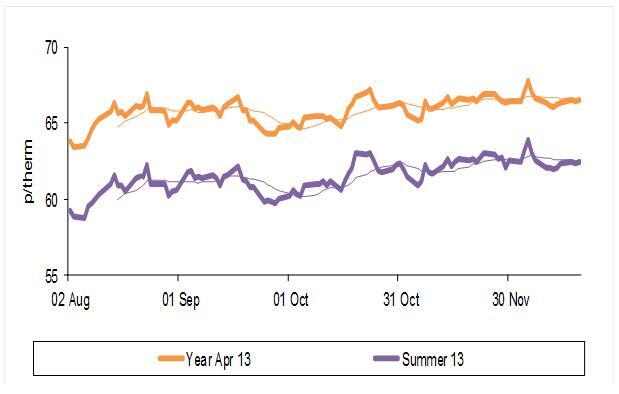 The annual gas price has now climbed 8% since July and is up 3% on the same month last year. Spot prices have been much more volatile than longer-dated contracts. 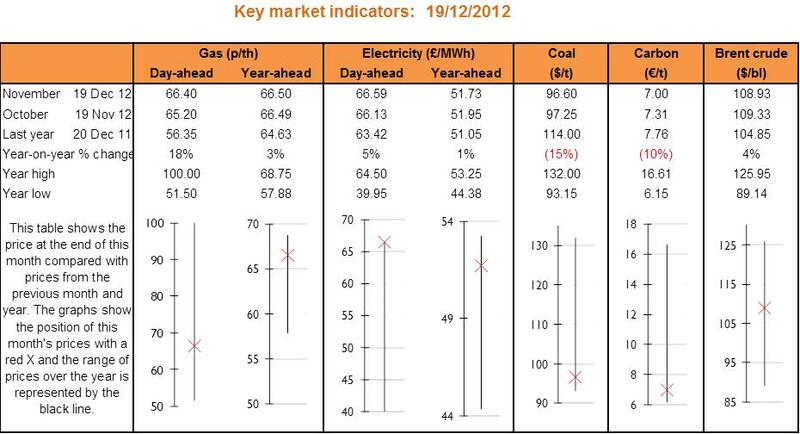 Day-ahead electricity and gas reached 10-month highs during the cold spell of early December. The day-ahead gas price ranged between 65p/th and 71p/th during the month, while its power counterpart has swung from £48/MWh to £55/MWh. The high volatility was driven by concerns that gas supplies were under pressure and that peak power would be met by rarely used power plant when wind speeds were low. Temperatures in January are forecast to be close to average in the UK with some risk of colder temperatures at the start of the month, according to the Met Office. Heating is generally provided by gas in Britain and when temperatures fall prices tend to increase as demand increases. However, it is likely that power prices will be kept in check by relatively cheap coal prices. There is some risk that gas prices could be affected if the UK’s finds it hard to attract LNG cargoes over the winter months. UK gas prices are generally higher than those in Europe, but cargoes may be diverted to south east Asia (Japan in particular) where higher prices can be commanded. Continued political instability in the Middle East could also affect oil prices, which are a key driver of gas prices. The annual April 13 gas contract rose slightly in December, reaching a high of 67.8p/th on 5 December. Longer-dated gas prices were fairly stable because other international energy prices did not see much movement through the month. Day-ahead prices were more volatile and generally increased. The day-ahead gas price reached a 10-month high of 71.3p/th on 5 December. 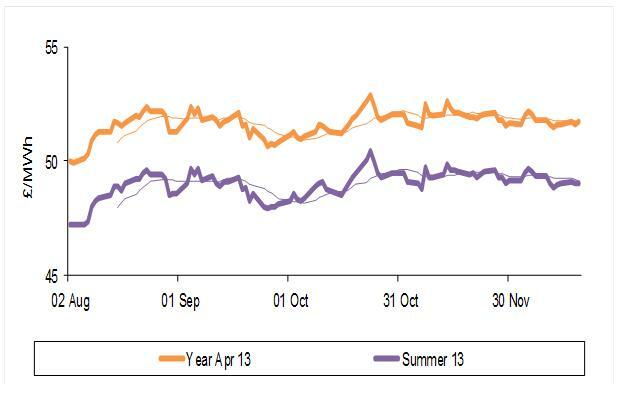 Prices increased following forecasts of colder weather, especially at the start of the month. Annual baseload electricity dropped by 0.4% to average £51.8/MWh during December and was affected by falling international energy prices. It peaked at £52.2/MWh on 5 December. As with gas, day-ahead power prices were very volatile during the month. 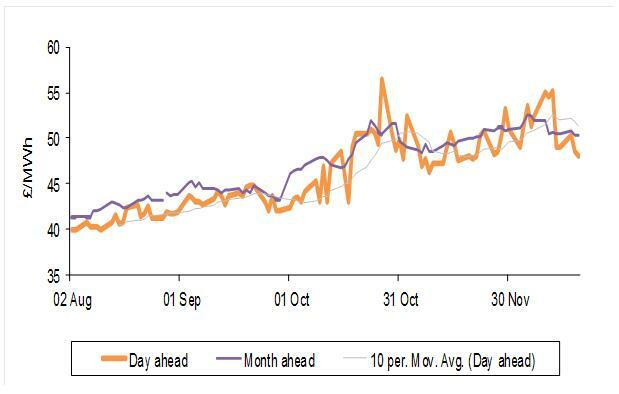 The contract reached a 10-month high of £55.1/MWh mid-month. 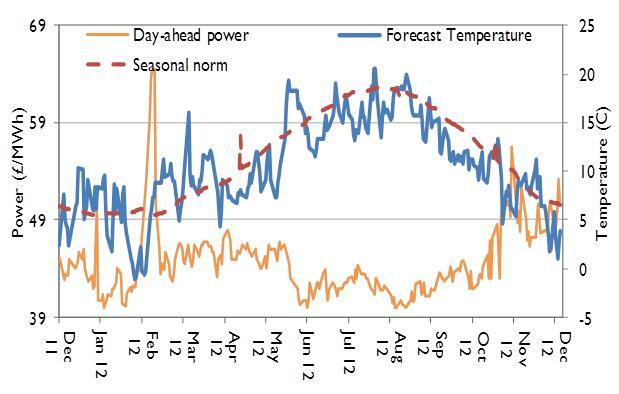 Low temperature forecasts and reduced wind output on some days of the month pushed day-ahead prices higher. Plans to simplify the Carbon Reduction Commitment (CRC) energy efficiency scheme will deliver a 55% reduction in administrative costs, saving around £272mn for participants over the next 20 years, the government has said. The CRC is a mandatory UK-wide trading scheme that was brought into law in 2010. It aims to improve energy efficiency and cut emissions in the large public and private sector organisations not caught by the EU Emissions Trading Scheme. CRC participants must measure and report on their emissions, and purchase allowances to cover them. Earlier this year chancellor George Osborne pledged to replace the CRC with a different green tax if the government could not find a way to simplify the scheme, which businesses have condemned as complex and costly. As part of the 2012-13 Autumn Statement on 5 DecemberOsborne confirmed the CRC will continue, albeit in a simplified form, at least until 2016. But the chancellor declared that the tax element of the scheme, which was introduced in 2010, will be a “high priority for removal when the public finances allow”. From the next phase of the scheme, which begins in 2013, the performance league table – the key reputational driver of the scheme – is to be abolished. But to maintain transparency aggregated energy use and emissions data from participants will continue to be made public on an annual basis. Osborne also confirmed that the government will conduct a wider review of the CRC in 2016 to assess whether it remains the appropriate policy to meet industrial energy efficiency and carbon reduction goals. It will then and consider whether alternative approaches might achieve the same objectives. The price of allowances remains unchanged at £12/t of carbon dioxide in 2013-14, but this price will increase to £16/t of carbon dioxide in 2014-15. But as allowances are bought in arrears the true cost of this increase will not be felt by participants until 2015. From 2015-16 onwards, the price of allowances will increase in line with inflation. Separately on 10 December, the government provided more detail on its simplification package. It plans to reduce the number of fuels that are covered in the scheme from 29 to two (electricity and gas for heating purposes). To protect organisations that use very little gas, a 2% threshold on minimum gas use will be introduced. Complex rules governing eligibility for Climate Change Agreements that qualify organisations for tax breaks have also been simplified, and the 90% rule has been removed. State-funded schools in England will be withdrawn from the scheme. The government is also to consider how the CRC can be used to encourage on-site renewables generation. If approved by parliament the changes will be introduced at the start of the second phase, in 2014-15. The simplification measures will save businesses money, but these costs are likely to be outweighed by the significant increase in the price of allowances from 2014. 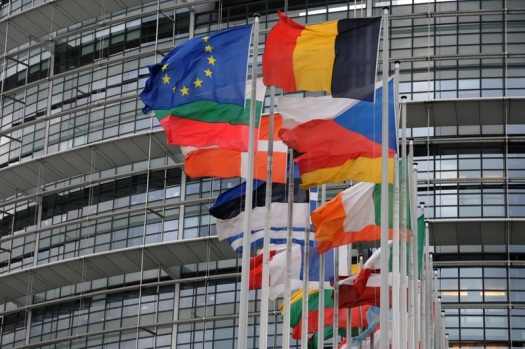 The government has unveiled plans to simplify administration of the EU Emissions Trading Scheme (EU ETS), and address the disproportionately high costs faced by smaller installations. The government anticipates the changes will save industry £39mn over the next seven years. Under the EU ETS smaller emitters pay more than larger emitters in administrative costs­. The simplification package, unveiled on 6 December, will see the set of 13 regulations reduced to just one, in a bid to drive down costs. The government also confirmed that small emitters and hospitals will be able to opt-out of the third phase of the scheme (2013-20). Those choosing to opt-out will instead be required to report under a scheme that aims to deliver the same carbon savings, but at a lower administrative cost. Rather than surrendering emissions allowances the lighter touch scheme would allow eligible organisations to set an emissions reduction target. The UK will also move to an enforcement system comprising solely civil, rather than criminal, sanctions. The EU ETS began in 2005 and now covers more than 11,000 factories, power stations and other installations across the 27 EU member states as well as Iceland, Norway and Liechtenstein. These changes are long overdue and are likely to help cut costs for small businesses. Alongside the 2012-13 Autumn Statement on 5 December chancellor George Osborne unveiled the government’s Gas Generation Strategy. But some stakeholders warned another “dash for gas” could follow, noting this would not be a “silver bullet” for the UK’s energy challenges. Consultant Ernst and Young urged the government to continue to invest in renewables, especially technologies that are “tantalisingly close” to competing with conventional energy sources. The strategy presented a scenario under which 26GW of new gas-fired power stations are needed by 2030 to replace ageing plants and secure energy supplies. A number of measures that aim to attract investment in the sector were summarised. The strategy also confirmed that the government will shortly consult on tax breaks to stimulate the development of the shale gas industry. On 13 December the government announced it would lift the current ban on shale gas exploration but that it would subject the industry to tougher regulations. Irrespective of whether shale gas comes to the fore, gas generation will continue to play a key role providing flexibility to the power system over the coming years. Business secretary Vince Cable has officially launched the Green Investment Bank. Speaking at the Bank’s headquarters in Edinburgh on 28 November, Cable said the £3bn institution would place green growth “at the heart” of the economic recovery. Cable also confirmed the Bank had made its first investment, committing £8mn to an energy-from-waste project in North East England. An additional £5mn will be invested to reduce energy consumption at manufacturer Kingspan’s UK facilities by 15%. It is the government’s intention that small- and medium-sized businesses will be able to take advantage of the new bank, which offers companies loans to invest in green capital projects. Businesses and households could receive financial incentives for reducing the energy they consume under new measures being considered by the government to dramatically reduce UK electricity demand. In a bid to cut electricity demand – and reduce the need for new generating capacity – the government is consulting on a raft of possible measures. They include paying businesses and individuals a fixed sum per unit of energy saved or financial incentives to encourage use of energy efficient equipment. More radical proposals could see individuals being invited to participate in a market where they commit to permanent reductions in electricity use. A new obligation on energy suppliers to deliver demand reductions in the non-domestic sector is also being considered. The consultation closes on 31 January. Final details will be unveiled during the spring. The government has launched a new funding competition to support energy efficiency training in the non-domestic sector. Training providers have until 4 January to apply for a share of the £100,000 funding, earmarked for the development and provision of courses that “expand the range of energy efficiency programmes already on offer for people involved in energy management on a day-to-day basis”. The government’s intention is that this fund will help improve energy efficiency training in the workplace, stimulate the market for such training, and raise the profile of energy and energy management within businesses. The latest round of UN climate talks ended on 9 December with a “historic shift” in principle. Negotiators at the Doha summit agreed a new package of measures, called the Doha Gateway Package. This package includes a second commitment period of the Kyoto Protocol, the only legally-binding plan to combat climate change, which will now be extended out to 2020. But the conference also cleared the way for the Kyoto Protocol to be replaced by a new treaty binding all nations together to tackle climate change after this date. But energy and climate change secretary Ed Davey said the talks were only a “modest step forward”. He urged countries to “do more and be more ambitious about reducing their emissions”. Concerns from businesses over the costs of energy and raw materials are mounting, according to a new survey by consultant PricewaterhouseCoopers (PwC). The Annual Global CEO Survey revealed concerns over energy costs and resource scarcity are at a three-year high, with 53% of respondents claiming it is a threat to business - up seven percentage points on last year. The issue has now overtaken consumer spending as a one of the top threats to business growth. The survey also found many businesses are planning to take action to address these risks, with nearly half of those surveyed claiming they will focus on reducing their environmental footprint and work to embed sustainability within their operations over the next few years.